This is one for the big screen. Beautiful, eerie, menacing, it could be a sci fi movie. (Stylish woman, mechanical system; all you need is the narrative.) But I also meant the big screen in a more literal sense: the full effect of the image comes through when it is blown up to dominate your desktop. Only then does the magnificent steel trellis suggest a cathedral vault, and the woman’s silhouette evoke a sense of foreboding, and the viewer sense that they are not far behind her on the ascending staircase. The light overhead is in a space of surveillance, and an uneasy fate seems to await her at the end of the hall; nor are we far behind. One thing it certainly is not is The News. 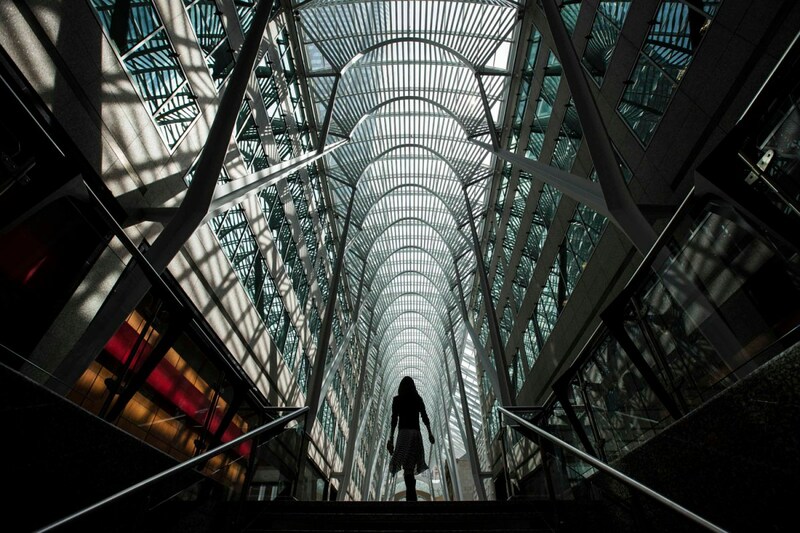 If you must know the literal details, the caption tells us that “a woman walks through Brookfield Place off Bay Street, on the day of their annual general meeting for shareholders in Toronto, May 7, 2014.” A shareholders meeting is not often a general news story, and this was no exception. Nor was it provided for expert analysis. For example, if you were doing an anthropological study of Brookfield Asset Management, perhaps there would be important insights or representative details to be gleaned from this image–I certainly would not rule it out–but that was not the reason that the photograph was provided at several slide shows for public viewing. Thus, this is an image without a story (a displacement that horrifies some critics of photography). So why should it be featured? One answer is that the image allows the artistic side of photography to come to the fore. Any photograph is both record and artifact, and much of the time the artistry remains relatively hidden. That’s the aesthetic norm for photojournalism and a principle for public art since at least Aristotle. But both sides need to be expressed, and just as people will occasionally accept very grainy images for their sheer documentary value, they also at times will enjoy artistically intensive images without paying much regard to their news value. Extremes here range from the Zapruder film to examples of so called “eye candy,” but short of those extremes there have been many remarkable images across the spectrum. This would be one of them. I don’t think that is a complete answer, however. Consider how this photograph is about at least two general conditions: modernity and photography. That is, it is not only a study of and in visual form, but through that lens the camera is focusing our attention on characteristic features of what it means to live within a modern technological society. She could be Max Weber’s “man” in the iron cage, or the last organic trace once the machine has overtaken the garden (an anxiety identified by Leo Marx’s Machine in the Garden), or a victim facing hideous mechanization in Metropolis. These and other literary and cultural statements are each attempts to capture something fundamental about modernity, and they don’t so much explain the photograph as suggest what it is doing; it belongs in their company, albeit with the limitations and distinctive qualities it has by virtue of being a photograph. The social theory and the artworks might provide important clues for further discussion, however: drawing on Metropolis, and noting how the spectator is almost looking up the woman’s dress, one can see both the tension between mechanization and eros, and consider also how well they can fit together for good or ill, and also why some modernists have celebrated an erotics of metal. An initial invitation to the male gaze can lead to a form of aesthetic excess, which then pushes back and asks when the gaze was ever pure. But I’m going farther afield than I had intended. (Eroticism will do that.) Let me suggest that the image does more than reprise familiar anxieties about modernity. Very briefly, I think it offers two insights. One comes from yet another comparison: she almost could be walking through the Crystal Palace that opened in London in 1851. Let me suggest that the photograph hints at a different sense of time than the liner time of modernity: instead, it suggests that modern culture is always mashing up its inheritances and its dreams: cathedral or crystal palace, hall of mirrors or space ship, classical atrium or prison cell block, the choice doesn’t matter because they all are there. And what is truly distinctive then remains to be seen, not least because it will be not familiar, but rather strange even to us. Which is why it also is an image about photography. I’ve suggested before that the single most important characteristic of photography is that its distinctive content is modernity itself. This photograph is a particularly good example of that. But it says more as well, and here the clues come from the human subject being a silhouette that is encased by a metal and class structure suffused with both darkness and light. Consider, that is, how she seems to be an image inside of a camera, or how she could stand for the human subject passing through the machine of photography. The silhouette is a distinctive type of abstraction, and its use here has a specific orientation. We use the camera to see modernity, and thus to understand how we see modernity only from within: from within modern social structures, and from within the technology of photography. Which makes this photograph’s question particularly interesting: Where is she going? Photograph by Mark Blinch/Reuters. A larger version of the image is in a recent slide show at In Focus. ← Previous PostSight Gag: Get Ready for a Big Smile!